BMTC’s current services serve nearly five million passengers every day. Last week, EMBARQ India was named joint winner of the Volvo Sustainable Mobility Award 2012, for its project with the Bangalore Metropolitan Transport Corporation (BMTC) on improving bus transport along the Hosur Road corridor in the city. 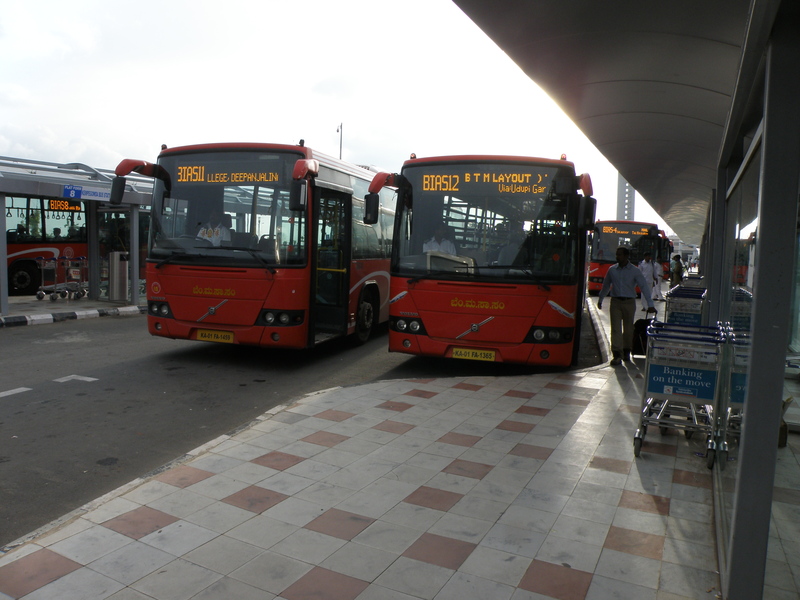 To counter the negative externalities of urban growth, and to effect an improvement in the quality and quantity of public transport in Bangalore, EMBARQ India recommended moving BMTC’s bus services from a model that offers destination-oriented travel, to a more efficient and integrated system, where bus routes would be organized in a ‘trunk-and-feeder’ fashion. In such a system, rather than connecting a certain locality directly to the city centre, feeder buses would connect the locality to the closest major arterial road, from where the commuter would then have to transfer to high frequency long distance trunk services to get to the city centre. This would save time for users, simplify the route network, and provide a more efficient and flexible system for transport planners to match supply to demand. TheCityFix spoke to Ashwin Prabhu, a transport planner at EMBARQ India, on the award winning project, and its potential impact on urban transport. What is the rationale behind introducing ‘trunk-and-feeder’ systems instead of direct services? An in-depth assessment of services along the Hosur Road corridor revealed that a large number of routes have a significant degree of overlap, running along the arterial for most of the journey and diverging only when they entered a certain locality off the corridor. Integrating these routes into a high frequency trunk service along the corridor, and introducing feeder loop services from the corridor to the localities would be a more efficient use of existing resources, and would allow planners to more accurately serve the demand. For example, this configuration would increase service frequency and capacity along the links connecting particular localities with the arterial corridor. When a new destination arises, say a new development or township, such a configuration also allows bus services to such areas to be quickly and easily launched, as now the locality only needs to be connected to the corridor, rather than all the way to the city centre. Different size buses can also be used for the feeder links, thus allowing system planners to accurately match supply to demand. Such a system would also allow for the introduction of alternate services like express routes, limited stop services, and short loop routes. These changes would positively impact travel for 2,75,000 bus passengers every day in the city of Bangalore. How would a trunk-and-feeder system improve travel despite forcing people to make at least one transfer? Would it not make their commute longer and inconvenient? Not really. This system would actually reduce travel time for users despite having to transfer. The shorter feeder routes would mean an increased frequency on those routes, and therefore shorter waiting times, and by increasing the capacity on the trunk routes, users would have to wait less then 5 minutes to transfer to the next bus. The disadvantage of the current model is that even though it connects two locations directly with minimal need for transfers, as the city grows, the number of routes required would increase exponentially. The number of buses would also need to increase exponentially to provide a given level of service. In the absence of such extensive fleet expansion, this would result in longer wait times owing to low frequencies on individual routes. In addition, the large number of routes would increase the complexity of the system for users. However, we do recognise that making a transfer can be inconvenient and cause irritation. That is why we are also working with BMTC to improve transfer facilities. International experience has shown that users can be induced to overcome their natural aversion to transfers, dependent on one major factor – making transfers as easy and convenient as possible. The top three reasons why people don’t like to transfer are long wait times for the subsequent bus, unavailability of seats on the second bus, and uncomfortable transfer areas. The first and second issues are resolved by the introduction of high frequency services along the trunk route. When buses arrive at intervals of less than 5 minutes, waiting time is minimised, and the increased overall capacity of the system means that the possibility of crowding or lack of seats is also minimised. The third issue is resolved by providing a high quality transfer station, which is protected from the weather, provides seating, is spacious enough to avoid crowding, and could also include other user amenities. A key component of this project is to work with BMTC and other stakeholders to design high quality transfer stations where feeder routes meet the arterial roads. How would this change affect the cost to commuters? The current fare system is based on a telescoping fare structure, and does not recognise transfers as part of the same journey. This means that pricing for the initial stages of travel is more than that of later stages, and when a person transfers to a different bus, the price paid in the initial trip segment is not taken into account. This would mean that, under the existing fare structure, users in a transfer based system would face higher costs. Therefore, the project also proposes to restructure the fare system to ensure that transfers are incentivised, encouraging the use of public transport for chained trips. It would also give the users more flexibility in identifying the most efficient travel patterns to suit their needs. How would this system impact urban transport in India? The benefit of an integrated system over the current model is that it relies on direction-oriented, rather than destination-oriented travel. This makes it easier to scale up as transport demand increases, allows uses to select the most efficient trip patterns, and helps system planners to accurately match demand to supply. BMTC already has an extensive bus-based public transport system, and has had an impressive track record of growth over the past decade, currently serving nearly five million passengers daily. However, the pressure on Bangalore’s urban transport system is set to grow significantly in the coming years, with the growing population and other effects of increased urbanization. In the absence of high quality, efficient, and affordable public transport, the majority of this increase in transport demand will be served by private motor vehicles, such as cars and two-wheelers. This is the case in several other cities as well. EMBARQ India hopes this pilot project will serve as a replicable model for similar networks in other cities across the country. Mainstreaming the idea of integrated and connected systems in public transport planning in India will be the key to achieving a future in which public transport captures the majority of travel demand in urban India.